Discussion in 'Music Corner' started by jkerr, Sep 17, 2001. Preference to the West German Londons. 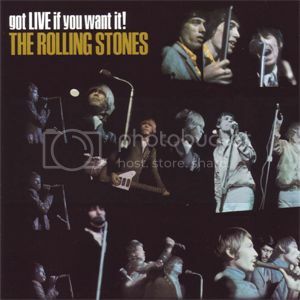 I own a complete set with "Live If You Want It"
To Luke the original OP when do think we might get a Stereo version of "Have You Seen Your Mother Baby" or "19th Nervous Breakdown"
Worth noting that the original mono mix of Got Live hasn't been issued digitally, and that while the London CD uses the original stereo mix, there are fades very awkwardly inserted between the songs for some reason. Officially? I wouldn't hold my breath. Thankfully they circulate. Thank you for thinking of me and attributing the post, but it wasn't me. And I still prefer the London CDs to the SACDs, including Beggars Banquet, even though you may not approve. Sorry, pulled the wrong quote string. The London CD of Beggars Banquet comes from an LP production tape that runs at the wrong speed, has reduced stereo separation, and just generally doesn't sound as good. The SACD is from the master. The Last Time, 19th, and HYSYMB are available on lots of different bootlegs. Time Trip 5 is not the best source for them. Play With Fire is *very* narrow stereo on at least some copies of the old ABKCO Hot Rocks CD, but otherwise Hot Rocks 1 is the only place for that and Satisfaction. Get Off Of My Cloud was in stereo on Hot Rocks 1 and some copies of December's Children. are the ones to seek out. voles and lukpac like this. Thanks, found 'Reel Time Trip' - never heard of 'Key To The Highway'. Is '2120 South Michigan Avenue' a good alternative? I heard that these CD's were created using the mastering tapes from The Rolling Stones Box MFSL LP's....do you know anything further about that? This question was posed in this thread fifteen years ago but never answered, so I thought I'd throw in what I know. Sorry I can't remember more details, but maybe someone else can fill in the blanks. Someone from the Stones camp was in the MFSL facilities to review their remastered tapes for the upcoming LP box set. Knowing that London was going to be putting the catalog out soon on CD, he stayed there all night long madly making surreptitious copies of the tapes, without MFLS's permission. So the tapes London used for that first batch of Rolling Stones CD were stolen property. David del Toro likes this. That's incorrect. ABKCO paid MFSL to make digital transfers of the tapes. While it seems at least some tapes were digitized overnight one night, that was done by MFSL. Nothing was stolen. Decca was then sent transfers which were used for the London CDs. ABKCO used some of the same transfers for their CDs, albeit usually with additional processing. stef1205, GetHappy!! and J.A.W. like this. That's good to know. I wish I could remember where I read my version of events so I could at least quote a source. It sounded pretty incredible, but if it's in print, it must be true, right? Lukpac, I went and read your piece (Q2.8.3) and I do believe that it was actually my original source. Maybe "stolen" was too serious a word, but Gary Giorgi's account certainly sounds like the copying was done without permission. And MFSL was pretty unhappy about the use of the tapes. Reading through this for the first time in a decade (thank you, lukpac! ), still no answer as to why those early CDs had fade-ups on songs. Absolutely baffling to me these were released with such blatant errors. "The British CDs have their origins in a lavish boxed set of ABKCO Stones LPs distributed by the audiophile-oriented Mobile Fidelity Sound Lab in 1984. MFSL, Inc. president Herb Belkin says his company produced a set of digital masters, at ABKCO's request, while MFSL was in possession of the stereo master tapes. The digital masters went to Decca Records in England for a series of LPs and CDs; MFSL itself didn't have CD rights. Belkin claims that Decca ran Mobile Fidelity's digital tapes through the Decca Digital System, "which changed the sound." He was so chagrined by the result that he asked Decca to remove the credit line - "Analogue to Digital mastering by Mobile Fidelity Sound" - from the CD packaging. Tony Hawkins, manager of the transcription department at Decca Recording Services in London, remembers receiving the digital tapes from MFSL. He says, though, that the tapes went straight through to Hanover for CD mastering. (PolyGram manufactured the British as well as the U.S. CDs.) Hawkins acknowledges that Decca Digital is an "in-house" system not compatible with the more standard Sony technology used by MFSL. However, "we couldn't even play [the Mobile Fidelity tapes] at that time 'cause we didn't have Sony equipment."" Note the *early* London CDs didn't, it was the later batch that did. I haven't heard anything first hand from those involved, but I've been told it was kind of a primitive form of noise reduction. Definitely baffling.